Going on holiday can seem like a hassle with all the documentation that you need to make sure you've got before you leave the house. This essential checklist should help when it comes to deciding whether you've packed (and applied for) everything you need. It's really obvious but when you're booking your trip, the first thing you need to do is make sure that your passport is up to date, or apply for one in the first place if you don't have one. Some countries have strict rules on immigration and won't let you in if your passport is close to expiring so bear this in mind too. 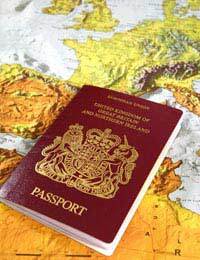 Getting hold of or renewing a passport doesn't usually take too long 'off-peak' but if you leave it until the last minute you'll find that you're reduced to having to queue outside the passport office - and that's never any fun. There are no hard and fast rules about visas, as all countries have different immigration rules, so the requirements are different from one country to another. Check with the Foreign and Commonwealth Office for any country you intend to visit, and make sure that you also check the amount of time that a visa application needs to be processed. What are you planning to do when you're away? Most people might think about renting a car or even one of those little scooters while away - so if that applies to you, you're also going to need to take your driving licence. Some countries also need an International driving licence before they will let you hire a vehicle, so check the requirements of the country you're visiting with the DVLA. Some holiday activities (skiing for example) need you to provide a passport sized photo before they'll let you hire equipment, so it's worth taking a few of those with you. Passports and other documents are easily lost and often stolen, so to make sure you're covered if anything essential goes missing, keep copies of visas, passports, tickets and any documentation you need to get around or get home. Keep a set with one or more of your travelling party, and leave a set with someone you trust at home. That way, you can always refer to them, and it will be easier to get replacements. Keep copies of travel insurance documents and contact numbers for the insurance company, so that if you need to contact them, you've got the details of your policy and cover on hand as well as their telephone number. If you have electronic documentation anywhere - electronic tickets, policies or travel documents, send a copy, or a link to the documents to a web-based e-mail account that you can access from anywhere? Do the same with contact details, passport and visa numbers too, and you will be able to refer to them as long as you find a computer with Internet access.